In 2001 the tournament moves for the last time, it gets a permanent home in the CityWest Hotel in Dublin. The field is set at 32 participants, something which today is still so. It is still being played over five days, something that will change later. In 2001, when the current tournament format was instated, it immediately became immanent that this gave opportunities to the underdogs. In the first round that year, which is played over the best of three sets, the number one in the world, Peter Manley and triple champion Phil Taylor fell at the first hurdle. Manley lost to Martin Adams, a BDO player who qualified for the tournament that year and Phil Taylor lost to Kevin Painter. It was the first defeat ever for Taylor at the World Grand Prix. This ensured that the tournament became wide open and it benefited the number two in the world Alan Warriner. 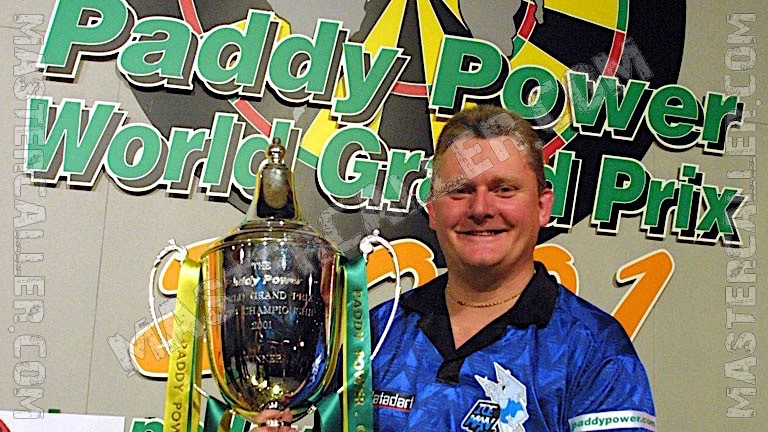 He grabbed his only major PDC title at the end of October 2001 by beating Roland Scholten 8-2 in the final. Scholten had made his debut a year earlier and became the first Dutchman to ever participate in the World Grand Prix. He played a great tournament in 2001, beating Rod Harrington in the first round. He then went on to beat Mick Manning, John Part and John Lowe on his way to the final. Besides his place in the final Scholten also had the highest finish that year with 164. Roland was also the first unseeded player ever to get to the final of the World Grand Prix.